This book is intended to provide an introduction to the basic structure and function of the brain and nervous system, emphasizing relationships with behaviour. The first chapter introduces the field, covering aims, objectives and ethical issues. In chapter 2 the neuron is described, and electrical and chemical conduction presented in detail; this chapter also introduces neurotransmitter pathways and drug effects on normal and abnormal behaviour. ; After a general survey of the behavioural organization of the nervous system in chapter 3, three chapters describe how language, learning and memory are related to brain mechanisms, with a particular emphasis on clinical data from human patients, and functional assymetries between the hemispheres. The following chapter outlines the Involvement Of Arousal Systems In Stress, Anxiety And Emotion, And Also covers stress reduction techniques. The arousal theme is maintained in chapter 8 in which sleep is discussed in the context of biological rhythms in psychological and physiological processes. ; Chapter 9 covers The Biological Bases Of Motivational States Such As Hunger And Thirst, and discusses the concept of homeostasis. Non-homeostatic drives such as electrical self-stimulation of the brain are also considered. Finally, chapter 10 reviews sensory processes in general, and then concentrates on pain perception and the brain mechanisms underlying visual sensation and perception. 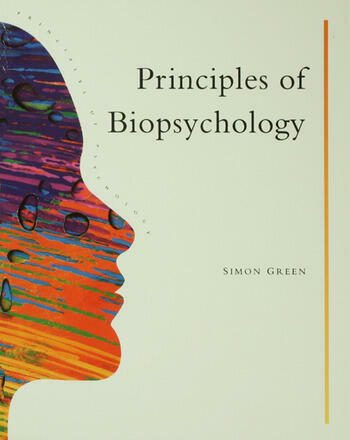 ; It is intended that the material in this book should satisfy the requirements of both the A-level syllabus for Psychology, whichever Board is taken, and first year introductory undergraduate courses in psychobiology. The nervous system - neurons, synapses, and neurotransmitters; the nervous system - functional organization; language and hemisphere function; hemisphere function - studies with the normal brain; learning and memory; Stress And Anxiety; Sleep, Arousal And Biological Rhythms; Motivation; sensory processes.